Learn to make your own web page using basic HTML 4.01 with this easy to follow beginner HTML tutorial ebook. Whether you have decided to make your own web pages by hand, using an HTML editing program or are using a website building set up these lessons will show you how to clean up your HTML coding, check for HTML coding errors and build standards compliant, accessible and user friendly web pages. No special software required. Using just a plain text editor, your browser and free online tools, create your own web pages for free! If you already have an HTML editor, learn what all that coding in code view means and how to correct/improve it. Learn HTML easily with our HTML basics beginner ebook. "THE E-BOOK IS GREAT! !...While I understood the basic html codes, I found that there was lots more to learn about coding. Her Basic HTML 4.01 Tutorials have been easy to understand and implement. 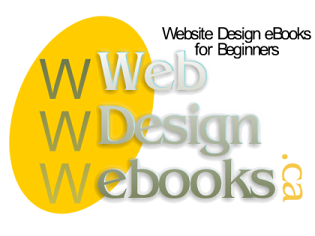 They are written in terms that someone with little or no knowledge of html can understand them but are not so simple as to be to easy of boring for an advanced user...I would not hesitate to recommend this book or her classes to anyone." Complete testimonial. Will be viewable to a broader audience! Have less HTML coding leaving more room for content! Will be search engine friendly! The Before We Start section gets you organized and ready to begin. You will learn how to create and organize favourites/bookmarks in a browser. Then you'll get all the supplies ready (text editor and folders) to begin. Basic Internet Understanding covers the basics of the internet, browsers and HTML. In the Basic HTML Document section you learn how to make a template that can be the basis of all future web pages. Each basic page tag (what every HTML page needs) is covered. Then we validate the template. Validation is the process of confirming that pages are coded correctly. Next we start building a Basic HTML Tag reference. The Basic HTML 4.01 Tags section covers the basic HTML tags you will need to know about when you make your own web page. Each lesson covers some theory, tips and an actual exercise for you to practice with. When you have completed all the lessons you will have working examples to use. Each lesson starts of with some basic theory of the basic HTML tag being covered. Learn Basic HTML at your own speed. Make your own web page using basic html tags with ease. Make your own web page with clean compliant code viewable by all on the Internet. HTML 4.01 Basics Simplified contains over 130 pages of theory, exercises and additional resources complete with over 85 images to help you along the way. HTML basics to make a web page. Order a copy now using PayPal's secure online payment system. PayPal is a free online payment system. Please make sure you click the appropriate Buy Now Button below for the correct currency. Clicking the Buy Now button will start the ordering process. Once your payment is received and verified you will receive an email regarding downloading your copy of HTML 4.01 Basics Simplified. The pricing above is for licensing for one only computer. If you wish to use the ebook on more than one computer, then you must buy additional copies.